Sea of Thieves - Supersize Your Spoils on Gold and Glory Weekend! Pirates love three things on the weekends: gold, glory and getting up late. After all, what's the point of being a rogue if you can't have a lie-in? We can't help you with that one, but we can help you with the other two on our inaugural Gold and Glory Weekend, taking place from March 15th-18th! From 11am GMT on Friday to 11am GMT on Monday, all players will earn a huge boost in gold and reputation rewards simply by delivering their spoils to the Trading Companies. Yes, you'll get far more gold and glory for the same amount of work, thanks to the Companies deciding that it's time to bring in fresh blood and dish out some pirate promotions (they're always trying to one-up each other). All you need to do to profit from this is take to the Sea of Thieves while the event is live, cashing in chests, skulls and other trade goods as normal! This is the ideal time for new Sea of Thieves players to jump on board and rise through the ranks quickly. The extra gold would prove useful for customising your personal pirate look! 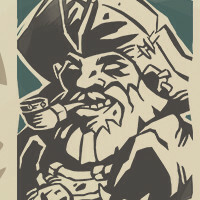 Of course, veteran pirates will also find this event perfect for grabbing those last few ranks and attaining Pirate Legend status before our impending first anniversary. So embark on a Voyage or five this weekend and enjoy handsomely increased fame and fortune on the Sea of Thieves. Gold, glory and great prospects await!